I woke to heavy rain at 6am, so went back to sleep. It was still raining at 8am, so given it was forecast to improve during the day, I opted for a leisurely morning drinking tea and reading Dara O'Briain's book. I finally set off walking at around 10:30am, by which time the rain was much lighter. 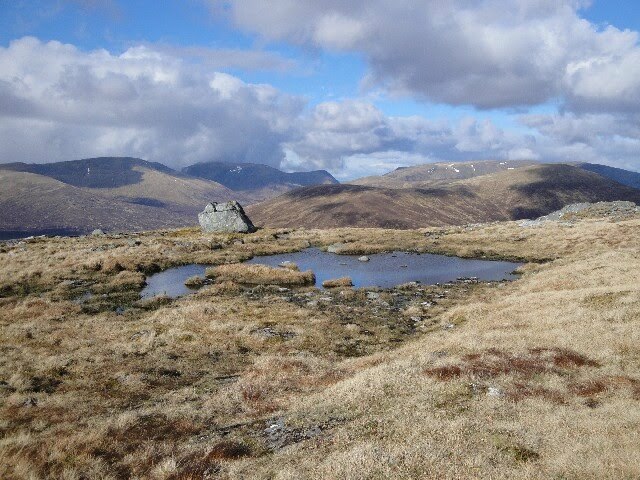 I soon entered the cloud as I ascended Beinn Pharlagain. This hill has many tops and knowls so it was quite confusing in the mist. 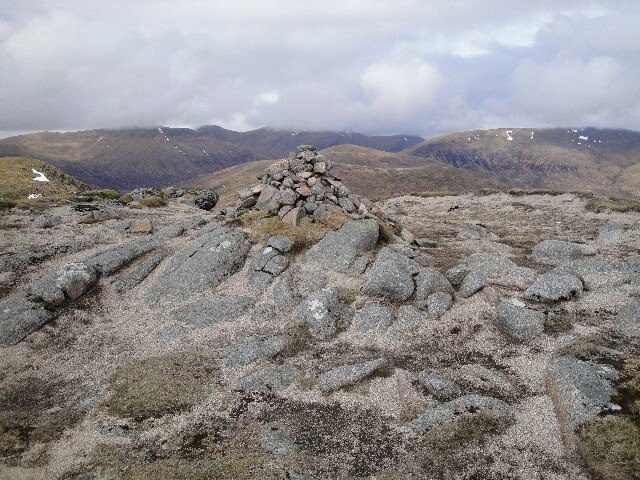 However I made sure I visited the south top of Beinn Pharlagain (Corbett Top) and I eventually reached the highest point of Beinn Pharlagain, Meall na Meoig (Corbett), shortly after 1pm. By now the rain had become quite heavy so I didn't stop long. After about half an hour the rain stopped, so I stopped for lunch whilst it was dry. As I was eating, the cloud started to clear and I got a good view of Loch Ericht. 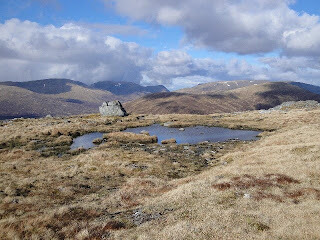 By the time I had finished my lunch, the cloud had lifted above many of the hills, including Sgor Gaibhre. 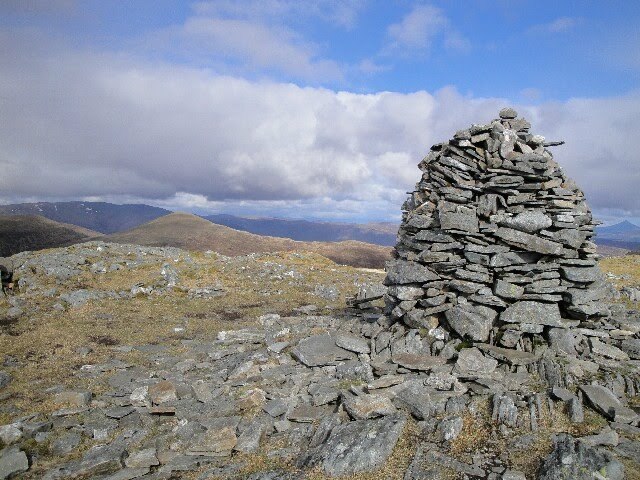 I pushed on to the summit of Sgor Gaibhre (Munro), which I reached just after 3pm. By now the sun was out and the views were excellent in every direction. 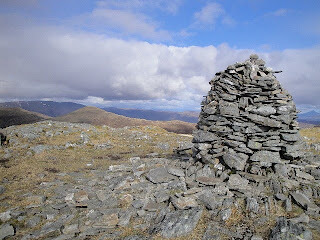 I could pick out tomorrow's hills to the north and there was a good view east to Ben Alder and Loch Ericht. As time was getting on, I opted not to detour to the top of Sgor Choinnich so instead headed directly for the summit of Carn Dearg (Munro), which I reached at 4:45pm. After a rest to admire the views, I headed down to Corrour Shooting Lodge and picked up the vehicle track north through Strath Ossian. I found a good spot to camp by the Allt Feith Thuill just upstream from the bridge so I stopped here for the night.